One of the groups, including 5 staff members and Head of School and Foundation Anne-Marie Kee, recently travelled to Ottawa to visit two places: The University of Ottawa to attend the Arts Innovation Panel – Inspiring Faculty of Arts Entrepreneurs; and Shopify Inc. a tremendously successful e-commerce company led by 37-year-old billionaire Tobi Lütke. Below are highlights of some of the key takeaways from our trip. “Get things done!” It’s one of the inspirational expressions (a politer version), mounted on the walls of Shopify’s 9-floor office in Ottawa. Words to live by for the company’s employees. Grouped with phrases like “Act Like An Owner,” “Build for the Long Term,” “Simplicity” and “Thrive on Change,” together, they represent the philosophical underpinnings of Ottawa entrepreneur Tobi Lütke (Head of Shopify) and the work ethos the company seeks to create for its employees. Shopify Inc. decorates its walls with words to inspire and motivate its employees. While visiting Shopify, we learned from our tour guide, Kyle Acres (a former educator from Greenwood College), that the type of employee innovative companies like Shopify try to recruit, is “T-shaped,” and exemplifies many of the characteristics of an entrepreneur. Possessing a deep vertical skillset in an area of specialty like math, engineering, design or communications, the “T-shaped” employee also relies on a breadth of experiential knowledge and confidence to share (laterally) across departments and teams. The “T-shaped” employee is motivated, creative, decisive, flexible and open-minded; a future-forward thinker, able to see the big picture; willing to take risks; and work together in teams or alone. This combination of skill sets and characteristics aid Shopify teams as they work together to identify problems and troubleshoot solutions. They are the qualities employers, like Shopify, are looking for in young graduates. It was interesting to learn that Shopify teams use complex project/solution and time management models like Design Thinking and the Getting Things Done (GTD) approach to help break down big jobs and solve complex problems. Design thinking is a model we’ve used with our students at LCS—an approach to learning that focusses on developing students’ creative confidence while fostering active problem-solving skills; characteristics and skill sets that are already being sought after in the workplace by employers. 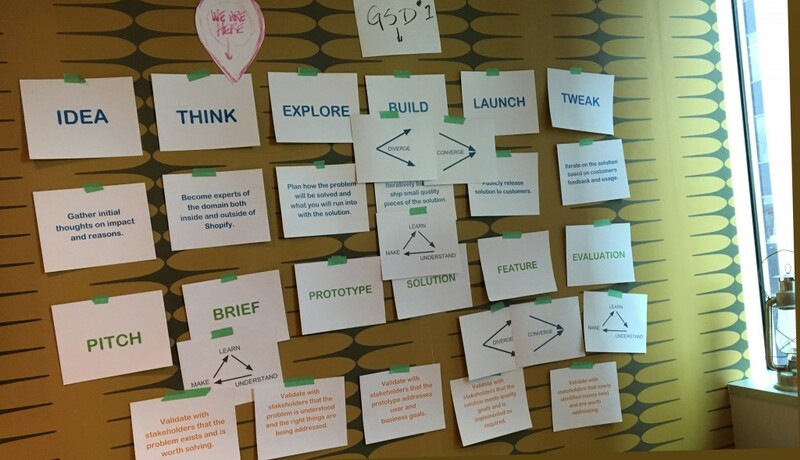 Shopify uses Design Thinking to get things done. Graduates of the future will need to be innovative and adaptable, and understand how to leverage their unique skills and knowledge to adapt to an ever-changing job market. They will likely forge their own unique career paths, which will change direction multiple times throughout their lifetime, and they must be prepared. They must be able to communicate well. Having the ability to synthesize new ideas and share them in a meaningful way will be critical to their success. Developing strong communication skills and encouraging a passion for continuous learning will ensure future graduates remain relevant, resilient and brave. At Lakefield College School, we can do our part by encouraging our students to read voraciously and broadly, to connect the dots in order to see the big picture, to get out of their comfort zones, seek out mentors and build their support networks, to find inspiration, seek out their passions and get things done. The usual results. Far beyond the usual suspects.